Continued from the last post, here are more sticky rice ball dumplings recipes. 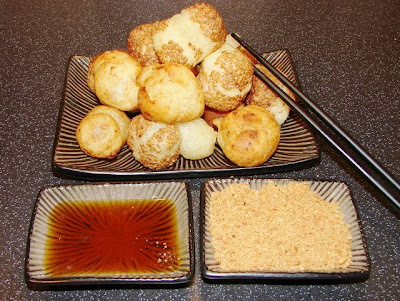 This next one is deep fried by far my favourite, very popular in our house and similar texture and taste to Jin Dui balls 煎堆 you get from the Chinese dim sum restaurant. Before you make the fried puff balls, get some roasted peanuts (plain unsalted is preferred, see this post how to prepare roasted peanuts the Chinese way. Blend the peanuts till very fine but not bind together like peanut butter. Also make some thick syrup by breaking some Chinese brown sugar (those like rectangular blocks) into pieces and heat with few tbsp of water. Heat till melted. Leave to cool slightly, if it solidified while cooling then you had added too little water, add more water and heat till the syrup is softened again. You can sub the syrup with warmed golden syrup. Deep fried as they are plain or wet the surface of the balls with a touch of water and completely coated with some raw sesame seeds. Heat oil till hot and deep fry the balls in a wok or deep fat fryer. Rotate the balls every now and again with a long tong or slotted metal spoon. The balls will expand to about twice to 3 times its original size. Deep fried till golden brown and drain on kitchen paper. WARNING: DO STAND BACK WHILE DEEP FRYING, THE BALLS WILL PUFF AND EXPLODE A BIT AND HOT OIL MAY SPIT. Pile the balls on a serving dish, have the syrup and ground peanuts ready by the side, dip the puff balls with syrup then coat with peanuts and enjoy. 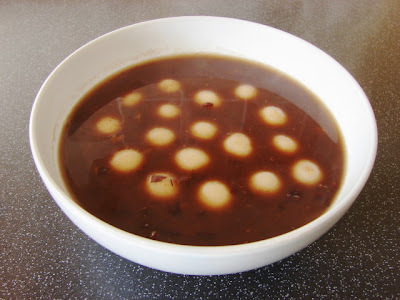 This is a sweet dessert soup not very popular to the Western palette but Chinese love sweet soup or tong sui 糖水. To make the sweet bean soup, add about 200g of aduki (red) beans and 1 large piece of dried mandarin/tangerine peel (for a hint of citrus flavour, if you don't like it leave it out) with about 6 cups of water and simmer for about 1- ½ to 2 hours till the beans are very soft and falling apart. (you can soak the beans overnight to speed up the boiling or use a pressure cooker). If the water has dried up quite a bite while simmering add more. You should end up a with a soup like texture but not thick. Add enough sugar to taste, can use normal sugar, palm sugar or Chinese brown sugar. Then make a batch of sticky rice dumplings, use about 150g of dough and roll them out into 1 to 1-1/2 cm wide balls. I like them quite small. Heat the bean soup to boiling, drop in the little dumplings and boil till they float and another minute or two extra.